They always say that 90 per cent of any ocean race is completed before the start line is passed. For Hungary's indomitable Nandor Fa the battle to get ready for the start of the Barcelona World Race with his new IMOCA 60 Spirit of Hungary makes the very act of racing around the world look straightforward. 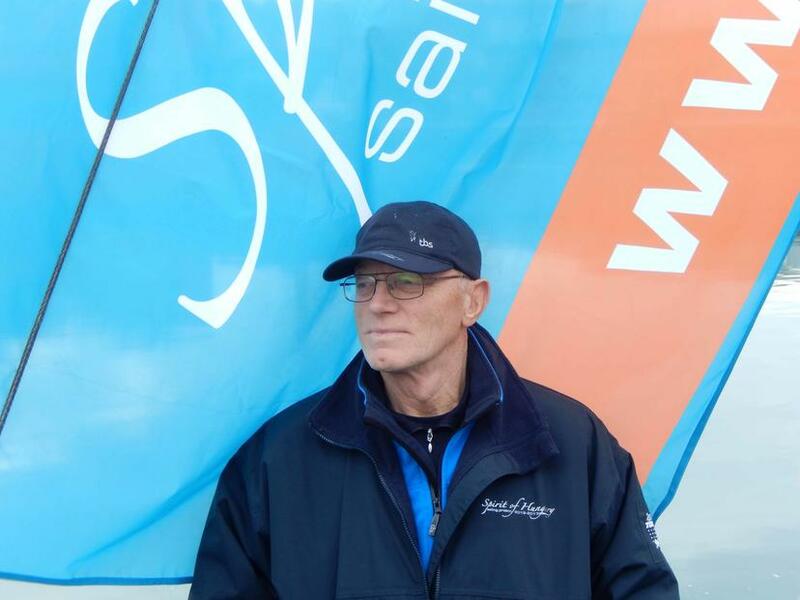 Fa, 61 years old, returns to ocean racing after 17 years away from it. His business commitments are no longer what they were, his family is older and involved with the project. The time is right for Fa - who raced in the first Vendee Globe - to come back to what he loves. Nandor, there must be times when you have questioned what you are doing. But why the Barcelona World Race? For me everything is right about the Barcelona World Race. It is the most fantastic race and is the right event for me to come back to ocean racing. It is a good question to ask why I am coming back again but in the end I know I have to do it. I just love the ocean, being at sea. I don’t have any dreams or expectations that we might finish on the podium, I really just want to finish the race and to know we have sailed a correct, good course, to have accomplished it well. That is much more important for me than the result, to finish satisfied. Do you have a vision of how the race will shape up on the water, where you might fit into the fleet? It will be interesting to see how the race develops on the water. Really I don’t think too much about who is who and what they might do. I never think who will be racing, who is here and who is missing. We are going racing I just know it will be close and intense, there will be rivals. It is a nice, good fleet – nice ‘sympa’ people racing and everyone is very motivated. How does your budget compare to what others have? We are in the same shoes as many, but I am the owner of our problems. We have no big shore team, it is mostly friends and family. Is it age or experience that is more important? I have no worries at all there. I am strong and have always been sporty. I run, cycle and kayak and still do a lot of sailing on the Balaton Lake. Meantime the boat has spent many weeks in the boat yard in Hungary being refinished and modified. That has put them a little behind their training schedule but the good news is that Fa and new Kiwi-American co-skipper Conrad Colman are en route for Barcelona, passing this Tuesday between the Adriatic and the Mediterranean. Since leaving Trieste they have been mostly sailing in upwind conditions which has been a good test for the boat, but quite unpleasant for the duo. Colman, who joined the project just a few days before the boat left Trieste, says he is enjoying the challenge, having a pleasant birthday moment on board Spirit of Hungary. Nandor, how was the final build up to leaving Trieste and actually getting sailing? It was such a busy time in Trieste after we transported the boat from Hungary. To start the last days we had to set rig and sails and a couple of days after the boat arrived there, Conrad arrived and gor straight to work. He has been happy help us and had a chance to learn some more abut the boat, but in the end the pieces became a boat. And the last two days were very tough with so much to do in such a short time. There were a lot of jobs to be done after the boat was in the yard for the modifications. We had to rebuild almost everything. All the fittings on the mast, electronics and sails. We needed about 10 people in the end on the last day, all busy from the morning until the evening. We will be at about 90 per cent for the delivery. The jobs are well done and the team was good. The boat does generally seem to be fantastic for me. But as far as we can judge the changes and modifications are really good. I am optimistic. I feel good about it. “The weather has made it tiring since we left Trieste, not just that it is upwind but it has been changing all the time, changing in strength and direction but we have been beating all the time non stop, sometimes it is down to zero, sometimes it is 30 plus knots with thunderstorms and so it has been really tiring sailing so far. We have had some technical problems. Right now we are 20 miles from stopping. We will have a short pit stop for a couple of hours and then will carry on to Barcelona. Anyway we are working very well together with Conrad and also with Peter. We are doing four hour watches and that seems to be working for us. You can ask Conrad later when we get there. We have quite a few small techncial things to fix, but we are happy. Progress has been a bit slower than we wanted but from the Strait of Medina it will better”. And Conrad Colman added: "I am 31 today. It is great day. I was sailing upwind having breakfast of cereal and yoghurt with the sunshine and it was a beautiful moment, having a good day. It has been a little bit complicated with the slamming conditions that we have had which have been good for testing the boat but that is never pleasurable. My grandfather and father always said a gentleman should never go to windward and I have long since not been a gentleman. It is nice to start to get a feeling for Spirit of Hungary."